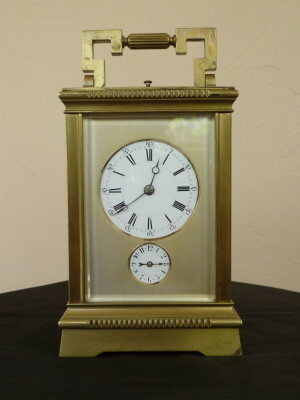 English Brass Carriage Clock with Alarm. English Carriage Clock. 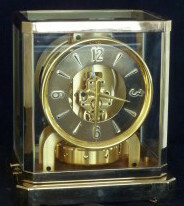 Beautiful brass with beveled glass on all four sides and at the top to view escape wheel. Clock was not striking properly and required major repair. Now it strikes on the 1/4, 1/2, 3/4, & at the top of the hour as well as strikes out the number of hours. Clock also has an alarm function. Made in England around 1930, it has a slightly Oriental motif with the brushed brass face plate accenting the enamel clock and alarm dial and the handle has an Oriental shape. It is rather large for a Carriage Clock standing almost a foot to the top of the handle.